Leap Forward Coaching’s approach is modeled on the established and successful system developed by SUN, Success Unlimited Network®. As Principal and Founder of Leap Forward Coaching, Melanie Ott chose training in the SUN coaching system, an International Coaching Federation (ICF) certified program, because of its focus on helping clients tap their inner knowledge to enhance personal awareness and guide life and career choices. Certified SUN coaches use a defined process that incorporates a guided inquiry technique along with SUN’s proprietary games and exercises to illuminate the path to success and personal fulfillment. As a Leap Forward Coaching client you benefit from the SUN system and Melanie’s experience, passion and commitment to achieve success on your terms. The Leap Forward Coaching method offers you a defined system and coaching support for making positive life changes consistent with your goals and values. As your coach, Melanie Ott is dedicated to helping you to identify what success means to you and to reach your fullest personal and professional potential. During your first meeting, you will meet with Melanie and have the opportunity to decide whether coaching is right for you through direct experience with the Leap Forward Coaching process. The goal of the meeting is to identify the results you want to achieve through coaching—whether these are accelerating your career or exploring a new one, achieving better work-life balance, making a major transition, or just finding time for fun and recreation. Melanie will also review all aspects of the two-way commitment to the coaching process and answer any questions you may have. During this initial phase, Melanie works with clients to identify where they are now in different aspects of their personal life and career, where they would like to be in the future and what they are willing to do to get there. The foundation of your Leap Forward Coaching experience is based on identifying your personal mission or Life Purpose. Your Life Purpose works like a personal compass to orient you toward higher purpose and your greatest potential rewards. Melanie uses her experience and a multi-step process to help you arrive at a succinct statement of what you find most satisfying and fulfilling. Your Life Purpose provides the all-important context and motivation for setting and achieving your life goals. With the new clarity your Life Purpose provides, you will work with your coach to develop a vision for each area of your life and determine what short-and long-range actions you need to take to make your vision a reality. The middle phase of Leap Forward’s Coaching process will be highly customized to fit your needs, goals and aspirations. 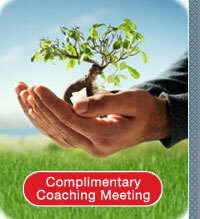 The focus of your coaching program will depend on whether you are an Executive, Life or Career Coaching client. The similarity between your coaching program and other Leap Forward Coaching clients’ is the common goal of living in alignment with your Life Purpose. The key is to develop the success-oriented habit of making choices consistent with your Life Purpose. Melanie incorporates her insights and skills to probe and challenge your thought process and she will partner with you to explore and experiment with new approaches and behaviors. You will play SUN’s Results Game® to learn how closely your actions track to your life purpose and visions, align with your goals and how that affects your sense of accomplishment and well-being. You will consider what constitutes a purposeful day and how to infuse everyday with more meaning and joy. As a Leap Forward Coaching client you will learn how to influence reality, make proactive choices and take charge of your life. Your Leap Forward Coaching program culminates with a full assessment of the progress you have achieved through coaching. As part of this process, you will review and refine your Guidelines for Living. These guidelines, developed by you, document what you have learned through coaching and act as a compass to steer and support you as you face future challenges and decisions. Guidelines for Living capture your approach to setting and consistently achieving task and well-being goals. Your Guidelines for Living includes a personalized list of the methods you can (and should) use to be your most effective self—consistently achieving the results you desire in all areas of your life. They summarize how you think and act when you are at your best and most successful.